Between 2012 and 2015, Russia delivered to India 148 Mi-17V-5s out of 151 stipulated by the contract. Russian Helicopters, a subsidiary of the Russian state technology company Rostec, will supply India with the last 3 Mi-17V-5 (NATO reporting name Hip) military transport helicopters in the near future, the company’s deputy director general said Tuesday. "The implementation of the contract continues. In the near future, the last three helicopters will be shipped to the foreign customer," Alexander Shcherbinin told RIA Novosti during the Dubai Airshow-2015. Between 2012 and 2015, Russia delivered to India 148 Mi-17V-5s out of 151 stipulated by the contract, the company’s spokeswoman Ekaterina Pavlova stated in August. It is planned that the deal would be completely implemented by year-end. The Mi-17V-5 helicopter is the latest model in Russia's Mi-8/17 helicopter family. Designed for personnel transport, as well as for carrying cargo internally or on an external sling, it can be used in search and rescue operations, and be equipped with weapons. 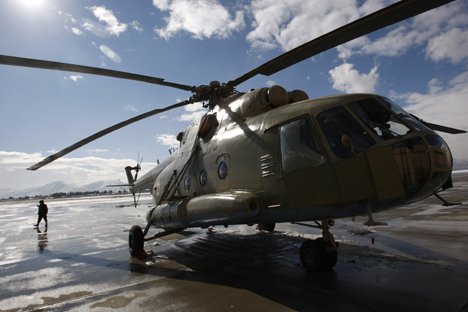 In 2008, Russia’s state arms exporter Rosoboronexport struck a deal to deliver 80 Mi-17V-5 helicopters to India. The agreement was implemented before the end of 2013. In 2012-2013, the sides added three supplements to the initial agreement to deliver 71 additional helicopters before the end of 2015. Mi-17s have been used in India since the government canceled an order for Italian helicopters amid corruption scandals involving Italian businessmen and Indian intermediaries.